I went on holidays this summer and had no idea that this project was going on, it was such a nice surprise. A great idea, I'm from Uruguay and playing in these pianos was being back home, in a happy place. Brings tears to my eyes when I remeber. I wasn't even aware the streetpiano project was on when I heard this guy playing so beautifully. He had his back to us and seemed so focussed on his playing he didn't realise he'd drawn quite a crowd. He looked really surprised by the round of applause he got as he stood up. Then he blushed and hurried away. Thanks steetpiano, this made my day. Sue & Theo, my nephew. 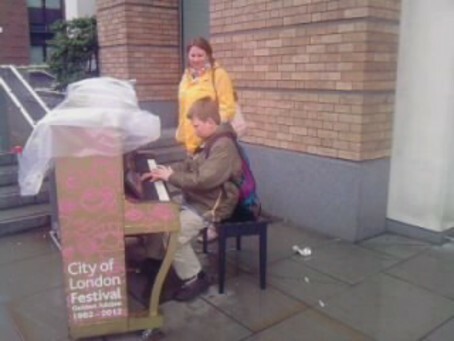 He is 10 and played 3 of the London pianos on our trip this weekend. July 8th 2012. If you are wondering ,He is AMAZING! This is my favourite piano so far! 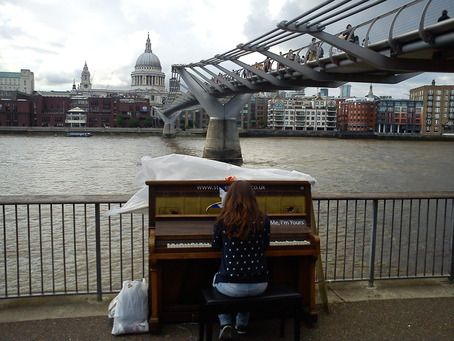 Walking along the river, I heard piano music. An uncharted street piano? Looking around, I discovered a piano lesson in a school music room! I had a good go on this one last night. My favourite location for a piano. If someone's already on this one you can just nip to the other end of the bridge to the other piano outside the Tate Modern. One slight niggle. I had some sheet music with me this year but all the pianos seem to have had their music holders removed so I was unable to use it. It was either too windy or just not possible to balance the music scores atop the open piano lid. George performs at Millennium Bridge. He is an incredible pianist at such a young age. I'm so delighted to have audience and sunshine support me.